A superb safari for the experienced rider, on a full day horse back safari, you will track game through vlei and forest, learning about their feeding and social habits, you will experience the incredible feeling of being ‘part of a herd’ that only a horseback safari can provide, as you move with a herds of kudu, and buffalo. You may encounter elephant as they browse seemingly unaware of your presence. You will explore the hidden game trails, secret channels and islands of the Zambezi, and learn about the flora, fauna and ecology of this magnificent area. 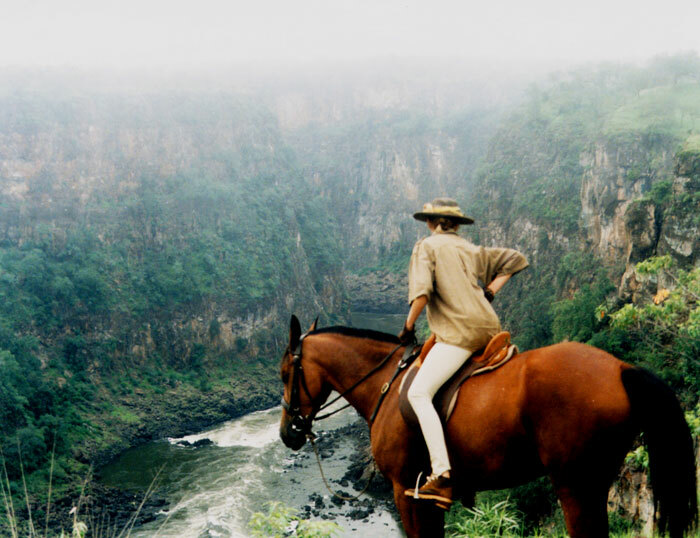 What a view of the Batoka gorge while on a horseback safari! You will ride along the magnificent Batoka Gorge and through the ancient Teak forests. The area is extremely scenic running through Teak Forest, Mopani Woodland and riverine habitat and supports a variety of game and birds. Lunch on a full back horse safari is a picnic on the banks of the Zambezi, or the Masuwe River, depending on the time of the year. Tea, coffee fresh fruit and biscuits are served at the start of the ride, lunch is a picnic, and cold drinks and snacks are served at the end. We carry bottled water and fresh fruit. Riding Ability: Intermediate to strong intermediate. This is a dangerous game area so clients should be confident at all paces able to do a rising trot, capable of riding a horse at a strong canter through rough country if necessary and happy to canter for longish stretches, game permitting! Length of ride: Up to 7 hours riding, plus a break for lunch. Please note that starting times can be altered to suit your needs – but please let us know. Please click on the links below to read more about the different trips that Alison offers, I know that she will also tailor make trips to suit your particular requirements. Minimum number of clients: 2 – there is a supplement charge for 1 client! Hats and Helmets - A broad-brimmed hat in canvas or light felt is essential, ventilated if possible. Plain leather or heavy felt is too hot, straw is too fragile. Peaked caps do not shade your head properly. If you only feel comfortable wearing a helmet, please make sure it is a ventilated one. The sort of lightweight ventilated helmet used for endurance or western riding is ideal, and it must have a peak (Troxel have some good ones). Polo helmets also provide excellent shade! However do bring shady hat as well. Please note that all children under 16 MUST wear a helmet. We advise that children bring their own for the best fit. We do have a selection available, but your own is always best. Dress - No black, no white, and no bright colours. Avoid tight clothing, and shoes – go one size up if anything. NEVER wear synthetic boots or shoes, always leather or canvas – actually long boots in any form should be avoided, and if you must wear something on your lower leg go for half- chaps……in cotton or canvas for this climate. If you usually ride in gloves, bring them, they do not take up much space. Chose your jodhpurs, jeans or riding trousers carefully –not all cuts of jeans are suitable for riding – and you will be in the saddle for long stretches of time. Avoid anything with lumpy seams. It is important to remember that even in midwinter it can be very hot in the middle of the day, so coolness is of paramount importance Always wear cotton. There's nothing cooler. Wear a loose fitting cotton shirt with short sleeves and a collar – this will protect your neck and shoulders from sunburn. You are also protected from thorns. Bring a light weight long sleeved one if you are sensitive to sun. Some clients bring a lightweight fleece seat saver, which can make all the difference! Weight limit: 90 kg. We reserve the right to not take a client whose physical condition is, in our opinion, a danger to themselves and their horse.